Before I get stuck into reviewing this lovely new album, let me declare my interest. I have known and played with Geoff Simkins at two venues in the past 40 years and have watched him develop his Lennie Tristano/Lee Konitz-based approach to jazz with admiration. Geoff was a friend of Alan Cooper (to whom, of course, this site is dedicated). They were band-mates in the Temperance Seven and became firm friends. Listening to Geoff in more recent times, it may seem strange that he would have chosen to play in an outfit like the Temps. But Geoff is a musician with respect for tradition and, like another British alto sax man, Alan Barnes, can move around the genres with ease. When I played in Coops’s trio in a City of London pub during the ‘70s (see The Rumboe Years), Geoff would occasionally deputise for our leader. His rollicking style at the time showed that he was moving in a more modernist direction although his playing always went down well with the predominantly trad-loving clientele. I didn’t personally encounter Geoff until many years later during the Coops trio’s residency at the Plough near Clapham Junction, south-west London (see Jazz at the Junction). Once again Coops would sometimes haul Geoff up from Brighton as a dep when more lucrative alternative offers came his own way. By this time, Geoff’s style was fully formed and he had made a name for himself on the British modern scene, often playing with his great friend and collaborator, guitarist Dave Cliff. Even so, he was perfectly happy to stick with a more mainstream repertoire that was demanded by the venue although, within my own musical limitations, we would occasionally try more adventurous tunes, to the probable bewilderment of the audience. 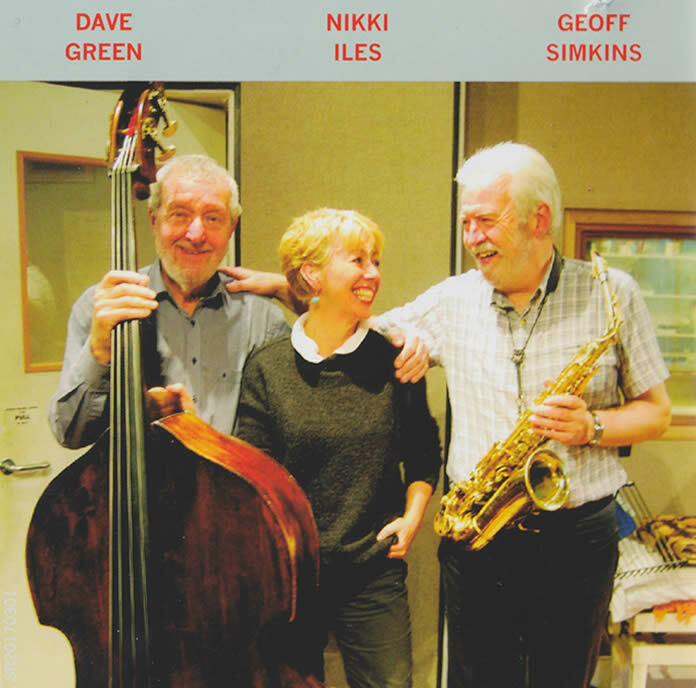 Anyhow, enough reminiscences for now and the real business of this page is to enjoy and reflect on this CD which features three of the UK’s top jazz exponents. Listening to an old interview with Chet Baker recently, I was interested to hear that during the last few years of his life, he toured Europe using only piano and bass as his rhythm section. He said he found drums superfluous and sometimes counter-productive to the sound he wanted to project. 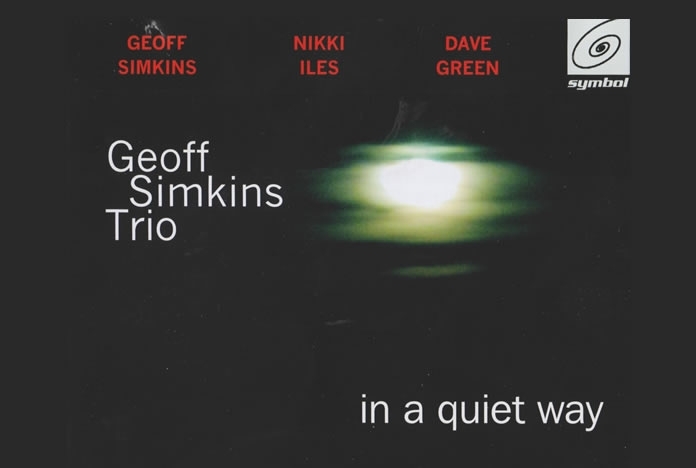 I don’t know whether the three musicians here would agree but Nikki’s percussive piano and Dave’s strong, propulsive bass combine well behind Geoff’s often lyrical alto sound and drums are certainly not missed. It is often a mark of jazz excellence that a trite number like Make Someone Happy can be transformed into something far superior by fine musicians. That is certainly the case with the first and longest track on the album. Nikki’s imaginative introduction teases the most out of the Styne/Comden Broadway tune and the trio certainly made me happy with their gorgeous interpretation. Two of the slower tracks, Elsa and Sareen Jurer are both waltzes composed by Earl Zindars, probably best known as the writer of How My Heart Sings and through his close association with Bill Evans. The trio deliver a sprightly version of Nobody Else But Me, another Broadway standard by two of the greatest American Songbook giants, Kern and Hammerstein. This reviewer was very taken with Friend-Lee from Geoff’s enormous influence, Lee Konitz, although Simkins's sometimes plaintive tone seems to pay more homage to Bobby Wellins than to the Tristano disciple. I had the pleasure of hearing Lee Konitz at a long-defunct club in Islington, London, about 20-odd years ago. Coincidentally, Dave Green was on bass and Martin France (I think?) on drums. I was disappointed to hear two rambling sets of improvisation which were unrecognisable to me, but, there again, it was probably unrealistic to expect him to still be knocking out Tristano-style pieces from the late ‘40s and ‘50s. The album concludes with For DJC, jointly written by all three players and is an elegiac tribute to Dave Cliff already mentioned above. Dave’s health has not been in good shape in recent years and the track exemplifies the love and respect in which he is held by all the jazz world. All in all, a lovely album featuring three players at the top of their game. I can’t help finishing this article with a memory of Geoff one night at the Plough, Clapham Junction (see also above). If this anecdote suggests that he is an aggressive or unkind man, he certainly isn’t. The audience was sparse and the bouncer was throwing ‘em in (thanks for that Ronnie!). We decided unusually to play a ballad to kick off. Geoff turned and directed a basilisk stare at her that would have felled a starving and marauding Bengal man-eating tiger at 50 metres.